Before I found my number one steakhouse of choice in Hong Kong, Grand Hyatt Steakhouse, I compiled a list of Top Classic Steakhouses in Hong Kong, which I personally think captures most of the best quality steaks on offer in this city. But all the places listed were expensive ones, where you’d be spending potentially HK$1200 or even more per person. 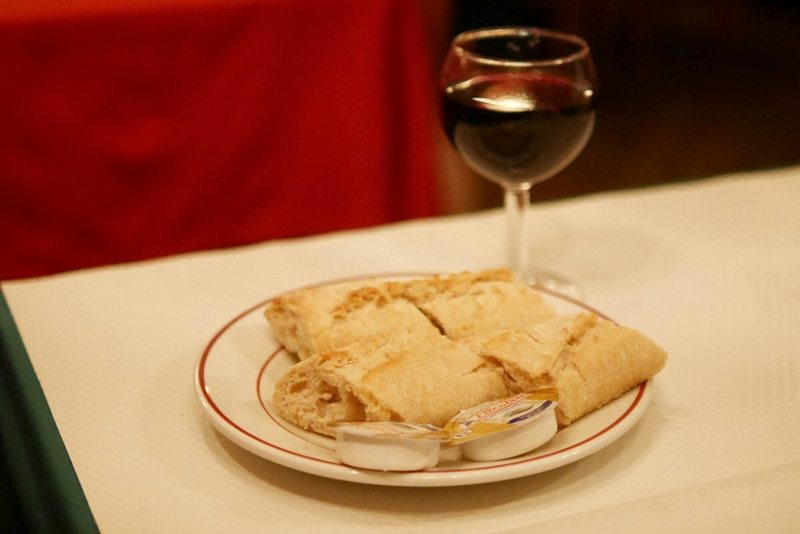 That’s not something we can all afford to do on a weekly or fortnightly basis, which is why Le Relais de L’Entrecote can easily become a regular steak spot for me. I wouldn’t call it a steakhouse because there is only one choice of dish on offer and you can’t choose your cut – they only serve sirloin. But at the bargain price of just HK$288, you’re getting a decently sized piece of meat which is cooked pretty perfectly, unlimited fries, and a salad as starters. 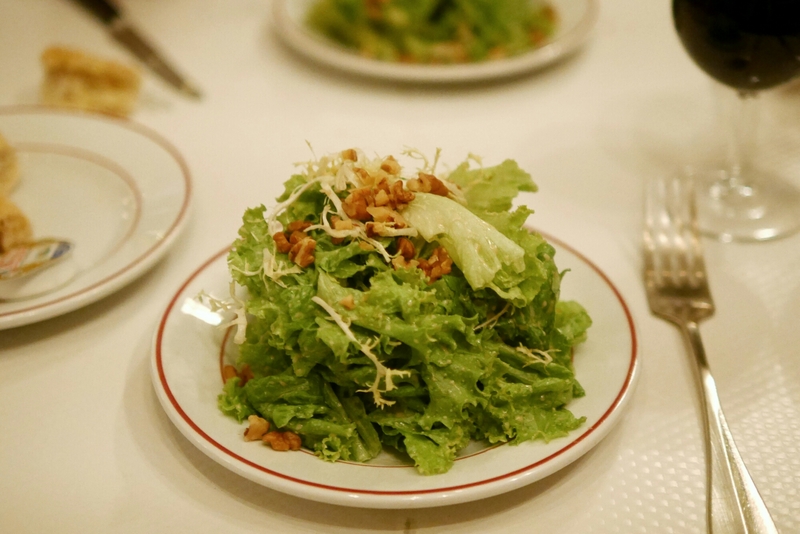 We started with some delicious French baguettes and a walnut salad. They were both good and a light way to kickstart our dinner. The portion of this steak frites meal was actually quite substantial. There are only four slices of meat pictured on my plate above, but that’s because they had only served the ‘first half’ of the portion on my plate first. All in all, this was about 60% of the steak. The quality of the steak was very decent, although some parts on the edge were a tad chewy. That’s acceptable though, as I wasn’t expecting the best quality tender yet flavourful piece of steak for this price. One of the selling points here is their “secret” sauce which was generously poured over my steak. The sauce was herby and tasty, but I would advise ordering the sauce on the side. My steak was so drenched in the sauce that it got a little salty in the end. The fries were perfect and super addictive. I was honestly really full after finishing the whole portion of steak and two servings of the fries. But the illustration of the Vacherin de Relais just looked too good to pass up on. 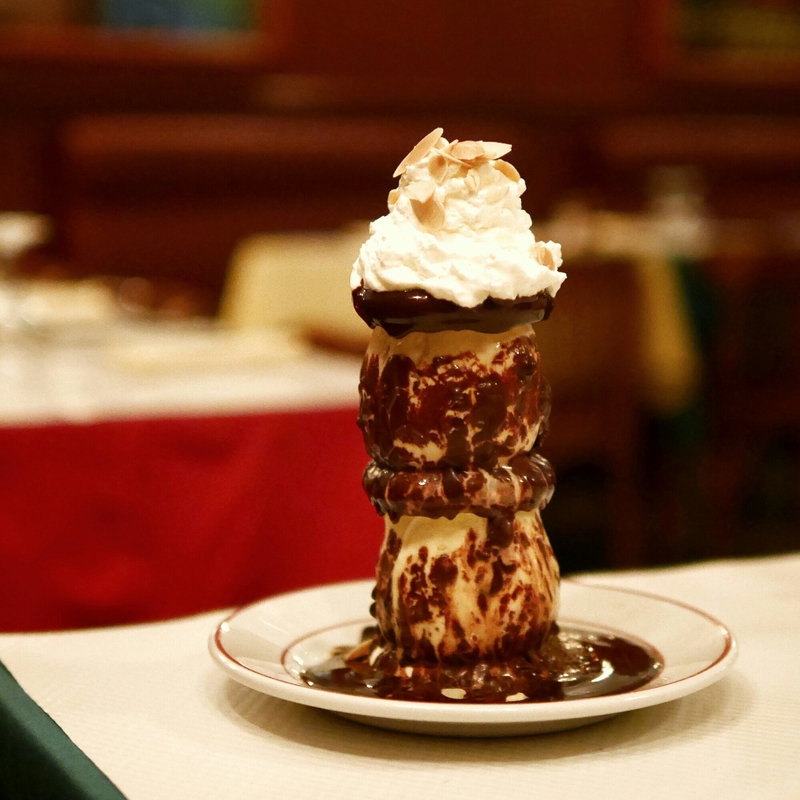 This tower of a dessert is made up of layers of meringues with vanilla and praline ice cream. Everything is homemade and the ice cream was so delicious. It was surprisingly not sweet – especially the praline flavoured one. This was a much needed contrast to the sweet meringue. 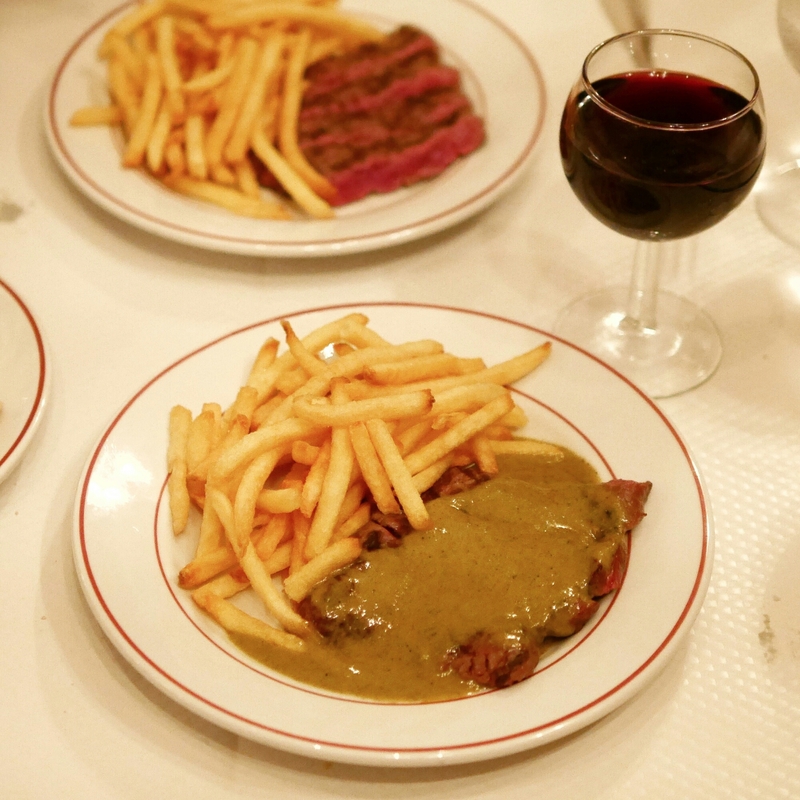 It’s tempting, even inevitable, to compare Le Relais de L’Entrecote with La Vache, which also operates in a similar manner (serving steak frites with a salad). Honestly, tastewise, I would say they are of similar standards, although La Vache serves rib eye, while Le Relais de L’Entrecote serves sirloin and the latter also features the secret herby sauce. I think the most significant difference is the vibe – La Vache is definitely more hip and buzzing, but it’s also annoying because you can’t make reservations. Le Relais de L’Entrecote, on the other hand, is much more fuss-free: you can reserve a table and the seating is pretty comfortable. At the end of the day, I’d go back to both!